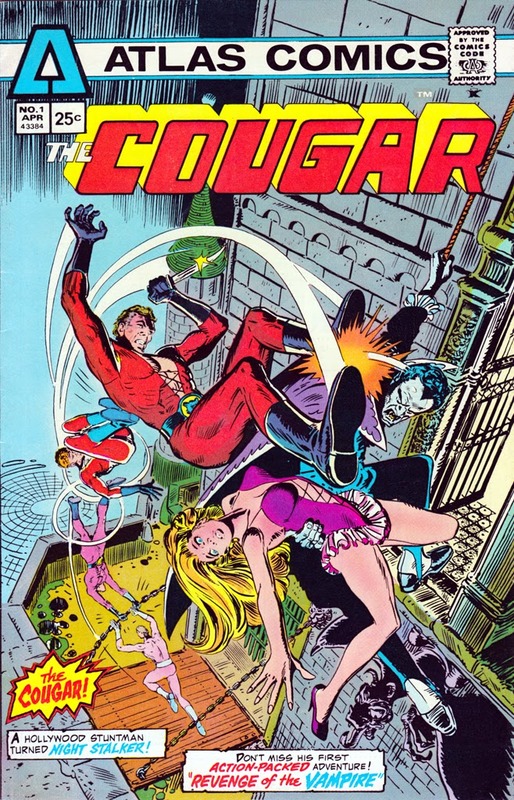 Kicking off vampire week of 31 Days of Horror is a look at a short-lived comic book series called The Cougar, from Atlas Comics. 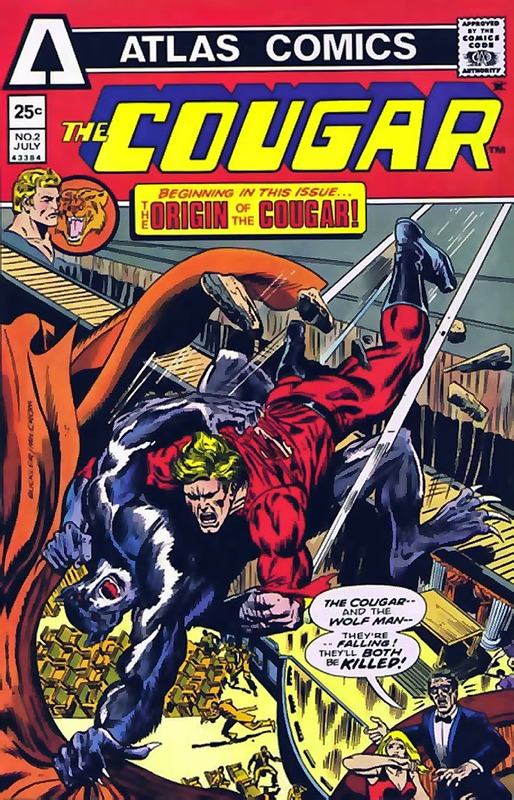 Based on the first two issues--which ended up being the only two issues--the premise had stuntman Jeff Rand (nicknamed "The Cougar") battling supernatural creatures, relying only on his own speed and agility. The first issue, aptly titled "Vampires and Cougars Don't Mix!" saw The Cougar battling a vampire named Count Krolok. 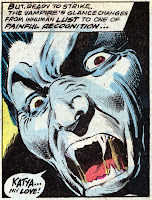 The story was clearly influenced by popular tales of the day, including TV's Kolchak: The Night Stalker (1974-75) and Dracula (1973), so it makes sense that this issue was dedicated to über-producer Dan Curtis. 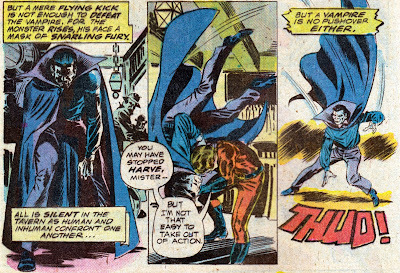 Not to mention that Count Krolok could have been a nod to Count von Krolock, from The Fearless Vampire Killers (1967). The story begins on a film set, which has just wrapped for the day. One of the crew members stays behind, in order to check out the local castle where they'll be filming the next day. He's surprised to find a coffin in the basement, which wasn't supposed to arrive yet; inside, he discovers a wooden stake jammed into the base--and he yanks it out, figuring it for a prop. Big mistake! The surrounding mist takes form, as a vampire is resurrected-- and finds his first meal in the veins of the unfortunate crew member. The result is the bloodiest scene in the comic, which doesn't pull any punches regarding the vampire and his prey. As The Cougar loses more friends to the bloodthirsty fiend, he risks life and limb to fend off the creature. Soon Count Krolok targets his next victim: the film production's make-up artist, Kathie. It's only when he's about to strike that he mistakes her for his lost love, Katya. The vampire then captures her, and plans to make her his undead bride. As the battle returns to the decrepit castle, it's left to The Cougar to save the damsel in distress. Although he's spent most of the story being pummeled by Krolok, The Cougar catches a lucky break--and manages to stake the vampire, and save the day! I should also note that Krolok is described as having fought the Turks back in the 1600s, and when he returned, it was as one of the undead! A veiled reference to Vlad Tepes, which--along with the lost love aspect--were clearly drawn from Dan Curtis' Dracula (1973). All in, the story is a bit silly, what with The Cougar running around in a red jumpsuit all the time--but this was the '70s, after all. Count Krolok is one of the best aspects of the comic, and it seems as though the series would have had a lot of creatures tearing at the pages. For the second issue, the stuntman battles a werewolf who turns out to be his own brother! Titled "A Walk with the Werewolf," the tale expands on The Cougar's origin story, and ends with the stuntman being permanently paralyzed. They had quite the teaser for the third issue: "A crippled cougar--helpless in a jungle of evil!" Who's to say if he would have recovered in some magical way? Unfortunately, Atlas Comics soon folded, leaving the story completely unresolved. Not that anyone is losing sleep over it.